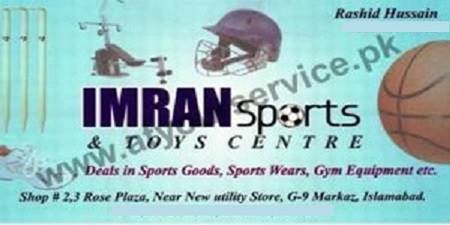 Irans Sports & Toys Centre is located in Rose Plaza, G9 Markaz, Islamabad. We deal in Sports Goods, Sports Wear, Gym Equipment, toys, and gifts etc. Thank You, Ma’am, for taking interest and sparing time to write your comments on this page. As a web-owner, I have improved the outlook of the page which you can see and I am sure, it will earn your appreciation. I am not in contact with the Shop Owner. This page can be further improved tremendously if the required information is provided by the Shop Owner. Due to the extremely large number of businesses listed on this website, it is not possible for me to contact each and every business owner. I am sure you understand my position. God Bless You and Your Family.